Can scientists make a living cell? 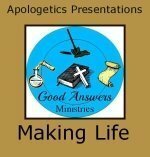 Find out with Dr. Gerald R. Culley in this Good Answers Apologetics Presentation! Dr. Gerald Culley has a ministry to young believers. Statistically, they are at risk: two-thirds of them will leave the church by age 20, largely because of secret doubts about the Bible. He offers a series of PowerPoint voice-over lectures on how archaeology, history and science support our faith in Scripture. Click here to view a brief video from Dr. Culley. These lectures may be presented in either of two ways. PowerPoint-based, they will run automatically with timed advances and narration. Alternatively, you may mute the sound and use the accompanying script to have a live presenter before the audience. Though offered freely, they are copyrighted material; the files may not be modified or sold, nor may admission be charged for any performance. Your FREE download will consist of a compressed (zipped) file. All standard operating systems have the ability to extract files from a .zip folder. Inside your download you will find a .ppt file (the PowerPoint presentation), .mp3 files (audio), .mp4 files (if video clips are included for this presentation), and a .pdf file of the script Dr. Culley has written to accompany the presentation.